Ewan also had his Thanksgiving program at school so I baked an apple pie. Then his birthday treat for school another day. Birthday cake and cookies for the big day…you get the idea, I’ve been busy baking and cooking. It is actually a relief that I don’t need to cook for Thanksgiving this year. We are going out for the first time ever. We are headed up to the mountains and will have our meal at the Biltmore Estate. There aren’t many places I would consider eating my Thanksgiving meal, but at the Biltmore we will dine in elegance and eat superb food. The menu is phenomenal, I may have to waddle home. That being said, I do look forward to cooking the meal again next year. This will be two years in a row of not cooking and enjoying our homemade bounty so next year may be over the top! Back to the recipe, these pumpkin muffins are perfection this time of year. I think I have made them close to ten times already this autumn. The boys go crazy for them! This is a twist on a family favorite I grew up with. My brother and I looked forward to these muffins every year. 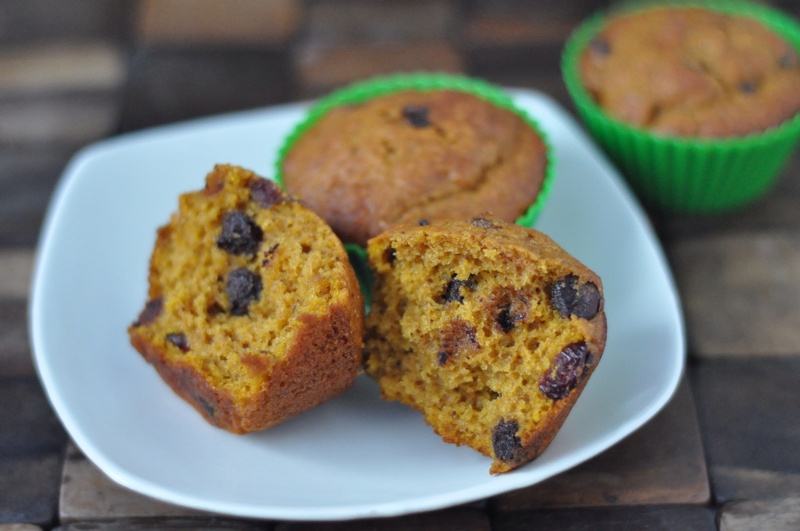 The version we grew up with was a pumpkin muffin with golden raisins, a classic that is hard to beat. Of course adding chocolate chips is hard to beat too, so I did! Cranberries are also a perfect match for pumpkin. They smell heavenly as they bake. We will be taking these to the mountains with us and eating some Thanksgiving morning, assuming I can keep the boys from devouring them all before then! Happy Thanksgiving to those of you celebrating. Preheat oven to 400 degrees and line muffin pans with wrappers or grease. Soak the cranberries in the hot water and let sit for about five minutes. Combine the pumpkin, eggs, sugar, spices and oil in a bowl and whisk well. Stir in the cranberries and water. In a small bowl combine the flour, baking powder, baking soda and salt. Add the dry ingredients to the wet and mix until just combined, stir in the chocolate chips. Place in muffin cups, approximately 2/3 full. Bake for 20-25 minutes. Than you Amy. Happy Thanksgiving to you and your family as well! wow–all whole wheat flour? Impressive! The look fantastic and the proof is in the muffin if you’re boys love them. You really do make them a lot and I see why 🙂 Happy Thanksgiving to you. Enjoy your lovely meal that you will not have to clean up after!!! Thank you! Happy holidays to you as well. I find it easy to put whole wheat flour in muffins without even changing the flavor. Tasty and healthy is a win win! Belated birthday greetings to Ewan and Happy Thanksgiving. Please send me some leftovers and waddle home safely. Have a great weekend! Thanks Liz. I managed to quit eating my Thanksgiving meal just before the need to waddle came! The food was extraordinary, Ewan in particular was in foodie heaven! These sound wonderful. What a fantastic combination of flavours. 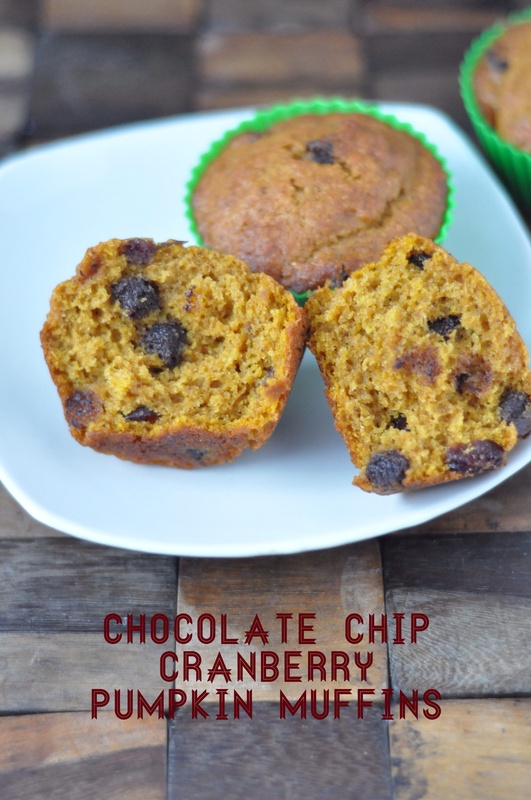 I had never thought of putting cranberry with pumpkin but I will definitely give it a try now. Emma. Oh yes, cranberry and pumpkin are excellent together! These muffins look amazing. Here in the UK most of the pumpkins disappeared from the shops straight after Hallowe’en, as if no-one wants them anymore. I do!! I’ll have to hunt some down for these delicious muffins. I had a problem finding fresh pumpkins after Halloween too. Sometimes I just resort to the canned pumpkin. Thanksgiving was outstanding, Ewan was in foodie heaven! It sounds as though life has been busy but delicious. Celebrating Thanksgiving at the Biltmore estate had to b memorable.